It wasn't that long ago that we looked at the ASRock ION 330 Nettop system that used the Intel Atom 330 CPU and the now infamous NVIDIA ION chipset. This system used DDR2 and your favorite 2.5" hard drive to make a small system that provide good performance, almost total silence and a very "green" footprint. 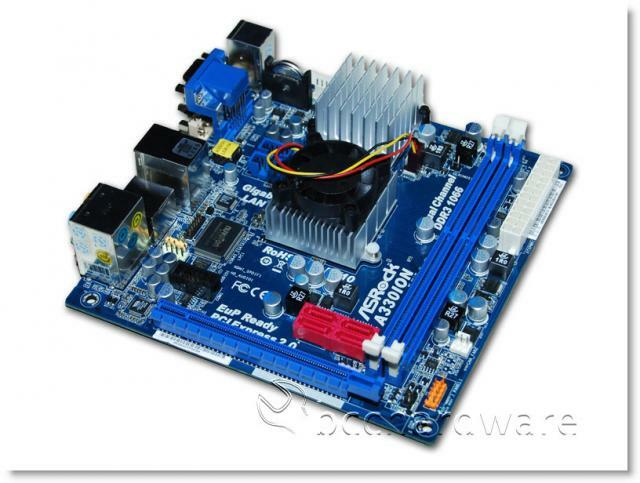 Today we are looking a motherboard from ASRock that operates on the same chipset and CPU, but allows DDR3 and a full-sized hard drive. 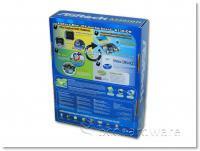 In fact, this little motherboard supports four SATA devices, 4GB of DDR3 memory and even a full-sized PCIe card. This would be great for your favorite TV-Tuner, entry-level GPU or anything else PCIe that you'd like to add to this loaded little motherboard. Find out if an ITX board is worth spending the money on, or if you're better off saving for something larger. 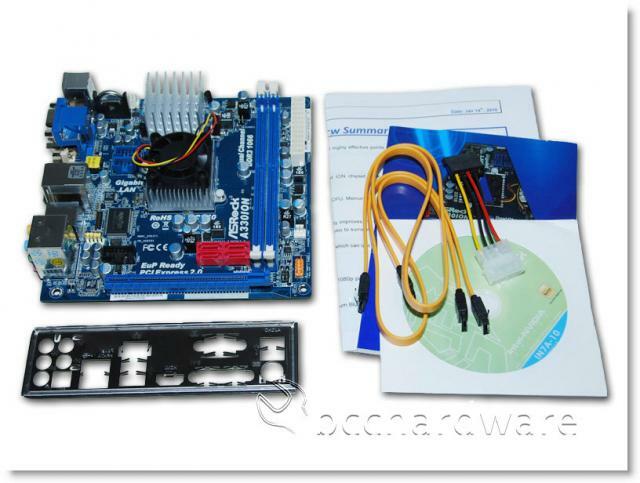 When you purchase a small ITX board like this, you don't really expect a lot of goodies. ASRock did pretty include everything you need to get going though. They have a pair of SATA cables, a Molex to SATA power cable, rear IO shield, quick install guide, manual, and CD in the bundle. This isn't a super-loaded bundle, but it is pretty decent considering the entire package can be had for just over $100 and that is not a bad buy considering all you need to add is some RAM and a drive. 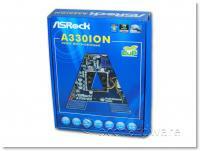 The ASRock A330ION motherboard is powered by the Intel Atom 330 CPU that runs at 1.6GHz, has dual-cores and is capable of Hyper-Threading. Oddly enough, the CPU is under the passively cooled heatsink near the top of the board while the NVIDIA ION chipset/GPU is hidden under the heatsink with the fan. A couple of interesting things worth noting before we move onward and take a closer look at the A330ION ITX motherboard is the location of the SATA ports that are just above the PCIe slot. The PCIe slot supports full-length cards and is actually capable of 16x performance on a PCIe 2.0 interface. Although there are two RAM slots, each slot can only handle 2GB sticks of memory - topping the board out of 4GB of memory. While the power connector is in a great spot, the SATA ports are a little close to the RAM and PCIe slot if you are planning on populating all of these slots. On the next page we'll take a closer look at the board before we take a look at the specs and features.